Sneaking in behind Paul, certain men troubled the churches of Galatia by asserting that one had to abide by the observances of the old covenant in order to be a Christian. Most noteworthy was the argument that one had to be circumcised, to which Paul alludes in Galatians 5. Such men were persuasive, at least according to human standards, and attacked Paul’s message for being seemingly weak and foolish by comparison (1 Corinthians 2:1-5; Galatians 4:12-16). 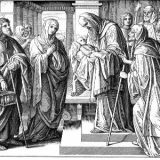 Had not the Lord Himself commanded circumcision? Why would we not want to obey the Word of the Lord? However, as Paul argues, they wanted to be “under the law,” so that they would be considered righteous according to the Law. But seeking after a law that would lead to righteousness, they did not attain it, “because they did not pursue it by faith, but as if it were based on works” (Romans 9:31-32). Christ becomes a stumbling stone for them, because they have fundamentally misunderstood why God gave the Law to them in the first place. Paul’s dichotomy between law and faith must not be distorted. “Law” as Paul uses it here cannot mean the Law in general, for that would run against passages like Psalm 1:1-2, Psalm 19:7, or even Deuteronomy 30:11. Paul contrasts the “law”—being perfected by the flesh, desiring to be righteous according to works—with “faith”—being perfected by the Spirit, being righteous through Christ. The Law in general, the will of God, is not at variance with faith (Romans 3:31). It is the distortion of the Law, made into something apart from Christ, that Paul condemns in the strongest terms throughout his letters. But these Judaizers have misunderstood the purpose of the ceremonies attached to the Law. They insisted on the observance of circumcision, because they regarded it as identical with the substance of the Law. Why, then, would it pass away, if God’s will does not change? But “these are a shadow of the things to come, but the substance belongs to Christ” (Colossians 2:17; Hebrews 10:1-4). Circumcision was a part of the guardianship of Sinai, not the means of righteousness. The ceremonies attached to the Law pointed toward the coming righteousness by faith, and therefore, properly understood, are expressions of the Gospel. 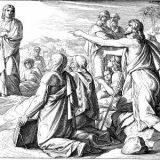 Once Christ came, their purpose came to an end, and the school of Moses was no longer in session (Galatians 3:24). Paul’s opponents, distorting their purpose and mistaking their substance, regarded them as part and parcel of righteousness, which not incidentally left no room for Christ. In the reading for the First Sunday after Christmas, Paul is therefore using the imagery of an inheritance. The Lord had made a promise of an inheritance to Abraham, something that could not be annulled by Moses 430 years later (Galatians 3:15-18). Moses had not meant to annul it, of course, but regarding the shadow as the light, as the Judaizers had done, makes one forget about the earlier promise. According to that promise made to Abraham, to which the ceremonies of Moses pointed, “in Christ Jesus, you are all sons of God, through faith” (Galatians 3:26). Therefore, Israel is likened to a child, the heir of the promised inheritance. Moses served as the guardian of this child, teaching him through the ceremonies attached to the Law, until the time appointed by the Father. In other words, the Church has matured into adulthood with the coming of Christ. 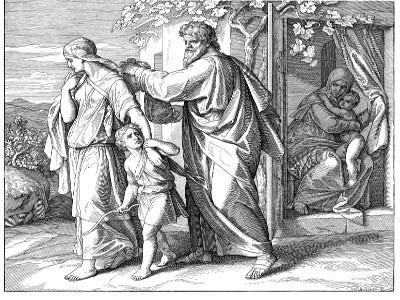 Such an image of Israel maturing from infancy into adulthood finds parallels in other passages, especially Ezekiel 16, where the Lord compares her to an exposed child on whom He took pity. “When Israel was a child, I loved him, and out of Egypt I called my son” (Hosea 11:1). This not only shows that God frequently treats a people as one man (or in this case, woman, His bride), but it also shows that there is a progression in God’s revelation and God’s manner of interacting with His people. The ceremonies of the Old Testament belonged to the childhood of the Church, but now with the coming of Christ, she has reached maturity and has put away childish ways (1 Corinthians 13:11). This is not to disparage the ceremonies of the old covenant! The pedagogy of childhood is not useless by any means. Through such discipline, the son becomes a man. But the one who seeks to remain in childhood, so to speak, is not praiseworthy, but missing the point of his guardianship. The Judaizers sought to hold on to the discipline of infancy, mistaking it for the substance of manhood. Circumcision pointed to the coming promise, the maturity of faith in Christ, and with the coming of Christ, the guardianship came to an end. But what of those who were not under the guardianship, the Gentiles? What of those who did not have Moses in their infancy, so to speak? We too had a childhood as a people, enslaved to the elementary principles of the world. The child under guardianship is akin to a slave, in that he must serve the will of another, despite being the master of the estate. But God sent Christ into the world as one of us, “born of woman, born under the law, to redeem those who were under the law, so that we might receive adoption as sons” (Galatians 4:4-5). The Gentiles have been made to be sons, even though our guardianship was not under Moses, through Christ by faith. The adopted son and the natural son are not two, but one (Ephesians 2:11-22), and therefore both are heirs through faith in Christ. Therefore, as Paul continues to say in the remainder of Galatians, there is no need for the adopted son to become as a child again, even though his guardianship was not under Moses. Such a reversion would be tantamount to crucifying the Lord of Glory all over again. Requiring the Gentile adopted son to be circumcised makes the ceremony itself into righteousness, and thus makes righteousness a matter of the flesh. Only by becoming a Jew could a Gentile be saved in such a way. However, as Paul says: “No one is a Jew who is merely one outwardly, nor is circumcision outward and physical. But a Jew is one inwardly, and circumcision is a matter of the heart, by the Spirit, not by the letter. His praise is not from man but from God” (Romans 2:28-29).